José Enrique Sánchez Díaz or popularly known as José Enrique, is a Spanish footballer who plays as a left-back defender and a left winger for Liverpool. José Enrique started his footballing career at Levante before playing for Valencia. Valencia sent him to Celta Vigo for a season-long loan spell, following which he was signed by Villarreal in 2006. On 6 August 2007, Newcastle United signed José Enrique on a five year contract for a fee believed to be £6.3m. Enrique made his Newcastle debut on 29 August, in a match against Barnsley in which he played the full 90 minutes. He finally made his debut in the Premier League as a substitute against West Ham United on 23 September. José Enrique is also admired for his ability to pick out team mates with long and very accurate passes. His performances were rewarded when he was made the official Newcastle United player of the season for 2009–10. He also achieved the accolade of being named in the PFA Championship Team of the Year. On 11 August 2011, José Enrique transferred to Newcastle for a fee of £7m. 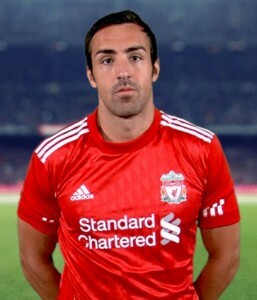 On 13 August 2011, José Enrique made his debut in Liverpool's first game of the 2011–12 Premier League. On 2 October, it was announced that the player had been voted best summer signing by Liverpool fans with 74.5% of votes. On 26 February 2012, he helped Liverpool to win their first trophy since 2006 as they won the 2012 Football League Cup Final. Is this Liverpool’s best XI? January transfer window - Who should Liverpool buy?